The idea of choice can be a very good thing. It starts with a basic idea of what you want. Once you decide that you want something that fits your needs and satisfies your wants, then it is time to break down toward the specifics. It is the way of the consumer, when presented with a plethora of choices. One could start real specific, but what if there was something else that attracts you even if it is different than anything else you are considering? It is always suggested to start from a higher level of the idea before getting truly specific. This is why shopping for a crossover is not an exact science. Crossovers and SUVs are broken down in so many different niches that it would be tough to find the right comparison between several models. The break down process starts with asking a few questions. How many passengers do you carry? How much cargo do you intend on hauling? Are you towing anything? What kind of performance do you need? How about fuel economy? What kind of equipment would you prefer to have? Now that you have exhausted every question possible, what kind of answer did you come up with? In case your answers include V6 power, three rows of seating with the option of folding the rear row down for some considerable cargo space and a sporty driving atmosphere without the snob brand appeal, maybe this one will solve your problem. 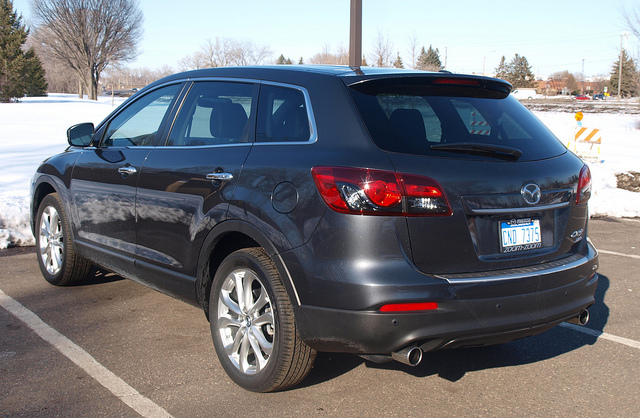 The Mazda CX-9 has been around for a few years now. It is one of the last Mazdas co-developed with Ford before they parted ways. It shares the same platform as the Ford Edge, but on a longer wheelbase to accommodate that third row of seating. This year, the CX-9 receives an update that integrates the latest brand design language onto its handsome silhouette: KODO – Soul of Motion. The KODO face certainly marks an improvement on the CX-9s looks. Though the big crossover was already a compelling package, combining “Zoom-Zoom” with volumes of space, the KODO elements would fool the meekest consumer in thinking it is a brand-new vehicle. The reality of the CX-9 is the sheer size of it. It is not as large as, say, a Chevrolet Tahoe, but it is the largest and heaviest Mazda ever made. The largeness of the CX-9 is relative, since Mazda has always been known for sleeker products – the RX-7, the MX-5 Miata, the original Mazda6…you get the picture. There are signs in which Mazda balanced its want of joining in the big family crossover fray with ensuring an air of “Zoom-Zoom” at every surprising turn. Of course, nothing about “Zoom-Zoom” states where a Mazda cannot have some of the largest doors in its class. Nor does it prevent such luxuries as a self-closing tailgate to be installed on board the CX-9. One wonders whether the twenty-inch wheels of the Grand Touring model is a little bit overkill for the Mazda enthusiast. Step inside the large doors into a cabin that reminds us of the outgoing Mazda interior design language. Recent turns in the CX-5 and test sittings in new Mazda6 denotes a somewhat restrained interior design compared to what is inside the CX-9 (and the current Mazda3). The instrument bin has the requisite chrome trimmed dials for the speedometer and tachometer separate from each other. The center stack was massaged to integrate the new TomTom navigation system now found in the CX-5 and Mazda6. To start up the CX-9 with its keyless system, you do not depress a button on the dashboard. Instead, you turn a knob where the key would normally be slotted. It is not unusual for this action to be present, that is, if you have driven a Cadillac CTS-V through its current and outgoing generation. The CX-9 provides huge seats for its first row occupants. Perforated leather with some suede-like trim and some dark red piping offer a throne that is both comfortable and supportive. 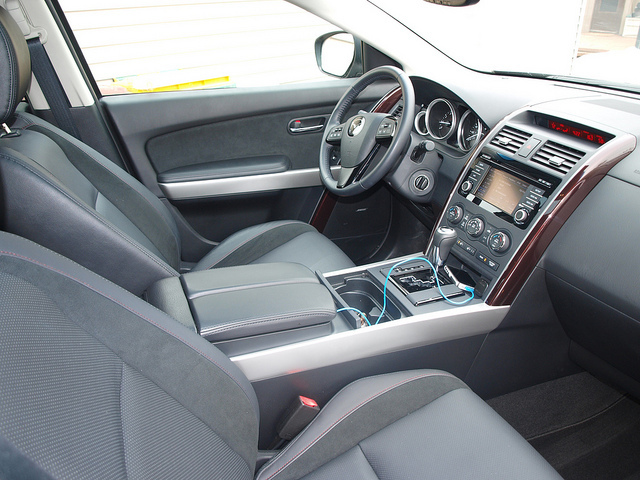 Power adjustments are available for rake, seat-back recline, height and power lumbar support for the driver. Front passengers get power adjustments, except for the lumbar support. Second row seating has the same leather upholstery with rake adjustment, a reclining seat-back and a center armrest with cup holders and a storage bin. The third row is not trimmed in the same leather treatment as the first two rows. To offset the black interior are some door and center stack trim that provided moment of curiosity. You could ask: “What is that finish?” According to Mazda, it is a Bordeaux metal finish encased in a clear housing in what would normally house either carbon fiber or a finished piece of wood. Room is decent for average adults for the first two rows. The issue is the position of the second row to ensure third row access from the large doors. Third row space is not meant for even average sized adults. As a saving grace, the second and third rows fold flat for huge and accommodating cargo loads. It also takes some adjusting to get comfortable behind the wheel, considering the huge space a driver has to ensure control of the CX-9. Front leg space may seem limited for some people, but there is enough room in the wells for necessary footwork. Others may think the front cabin may be a bit too big – all things being relative, of course. Bose provides ten speakers of Centerpoint Surround Sound power from the new audio/navigation faceplate. The CX-9 offers up HD Radio and SiriusXM satellite programming, along with iPod/iPhone connectivity and Bluetooth streaming. Phone syncing is also done through Bluetooth. In all, the entire infotainment system fills the cabin with wonderful noise. 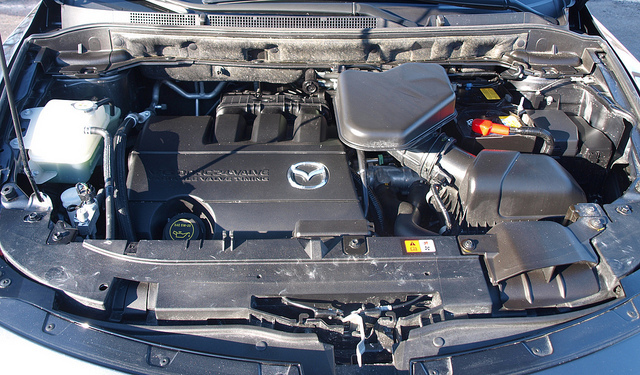 Under the hood is Mazda’s 3.7 litre V6 monster originally co-developed with Ford. The big V6 has 273 horsepower and 270 pound-feet of torque to offer. While this engine worked extremely well in the last generation Mazda6, it works as it does in the CX-9. To gain enthusiast-level satisfaction, you work the throttle a bit more to get all 273 horses to motivate a 4550-pound beast across town. That is where the “Zoom-Zoom” comes in – the V6 does the job to get the CX-9 in the mix whether in-town or out on the highway. The V6 is tuned to tow 3500 pounds of anything behind the rear axle. Connecting the V6 to the wheels is a six-speed automatic transmission and an all-wheel drive system with Active Torque Split. In reality, the drive system is supposed to sense where grip is lost and send power to balance out traction. It works quite well without complaint and without some button or knob to override the system. Augmenting the all-wheel drive is a set of anti-lock brakes and traction control. Because of its size – twenty-inch Bridgestone Dueler tires included – the ride is best described as solid. It tries to absorb imperfections in the road, including potholes, with a balanced ride package. The CX-9 will show you some lean on extreme curves and cloverleaf interchanges, but it does a nice job gathering itself up after being twisted around. 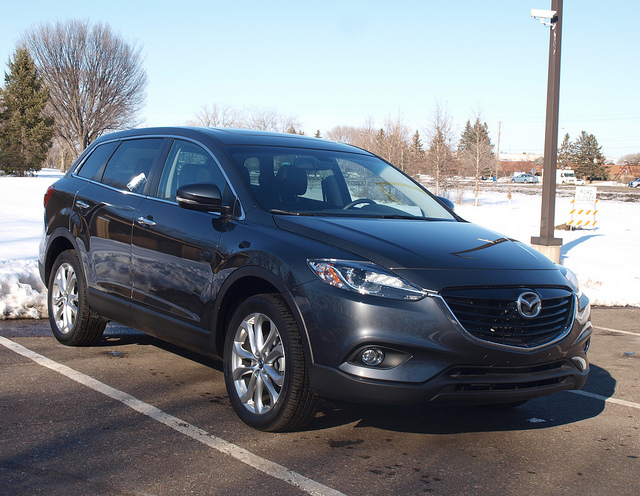 Handling is fine, but relative considering the purpose of the CX-9 compared to the remainder of the Mazda lineup. Normally, Mazdas have sharp, quick, and perfectly weighted steering. On the CX-9, enthusiasts would be a bit disappointed. Then again, this CX-9 is on a relative scale, as the steering action is weighted just right for its purpose. Do not expect a quick reaction from the steering box, though turning is competent and exacting for the size and volume of the vehicle. One part of the CX-9 that took some consideration was the braking. Granted, there are mid-sized crossovers that have sharper braking. Again, things being relative, the CX-9 does a decent job stopping in normal and panic situations. There is enough rotor space to keep the big crossover in check when the brake pedal is depressed. There was one huge drawback on the CX-9 – in the fuel tank. The overall consumption in the CX-9 wound up with a rating of 16.3MPG. If you do not mind such consumption in your mid-sized three-row crossover/SUV, the reward is a strong and versatile vehicle that is good for the long run. Luckily, you can get a fully loaded CX-9 for under $40,000, as with this Grand Touring tester with the Tech Package. Prices start at around $30,000 for a Sport with front wheel drive, but climb within a $10,000 range. While some of its competition keeps on pricing beyond the $40,000 threshold, the CX-9 retains plenty of value for what you get on board. Despite its size, some details, and its need to drink volumes of petrol quicker than its competition, the CX-9 should be considered among three-row, mid-sized crossovers. It is garnering all of the accolades reserved for volume sellers, such as the Ford Explorer, but it does so in a rather quiet fashion. The CX-9 does not need to shout its credentials. It is more than competent and does a lot of things very well. If you want to quantify its “Zoom-Zoom” credentials with what it does for families and other adventurous people, consider it being relative to its mission. It is a mid-sized, three-row crossover after all – and quite a nice one, at that. If you don’t need All-Wheel Drive, the FWD (front-wheel-drive) version of the CX-9 costs less and performs better in several areas. It accelerates from 0-60mph almost a full second quicker (7.2 vs. 8.0sec), overall fuel economy is improved by 2-3mpg AND the reduced weight and lack of friction from the AWD system also give it sharper handling!